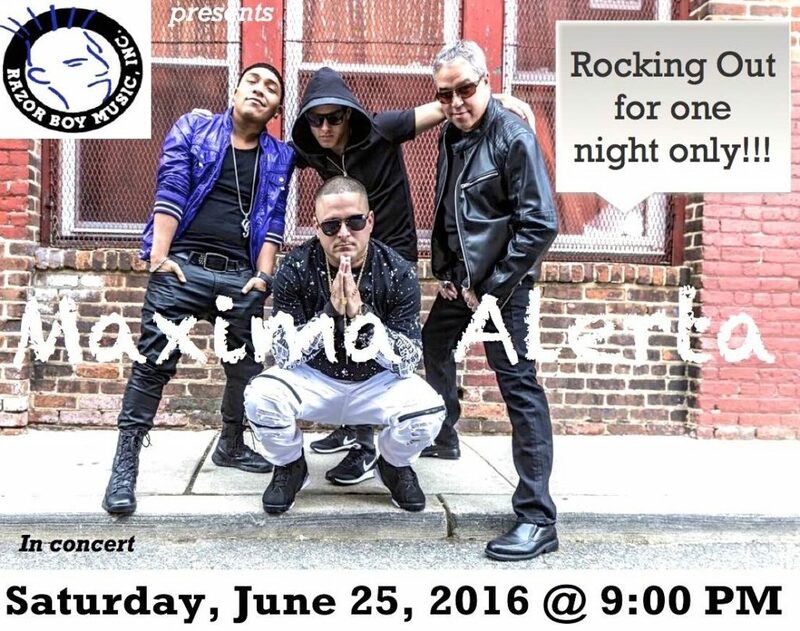 Razor Boy Music presents the musical group Maxima Alerta at The Bitter End, located in Greenwich Village, 147 Bleecker Street (between Thompson and LaGuardia) New York City, NY 10012 on Saturday, June 25, 2016 at 9:00 PM. Maxima Alerta is one of the best known bands coming out of Cuba. The band is now based in Hudson County, and have been selling out concerts wherever they play. They are celebrating the release of their new single “Vive la Vida” https://m.youtube.com/watch?v=9YEtBVjltIc. Established in 1961, The Bitter End is the oldest rock and roll club in New York City. The classic red brick stage backdrop and intimate vibe make this historic venue almost as iconic as its headliners. For over 50 years, audiences have been blown away by legendary artists like Stevie Wonder, Bob Dylan, Lady Gaga, Jackson Browne, Neil Diamond, Gavin DeGraw, Woody Allen, Jon Stewart, Randy Newman, Billy Crystal, Tommy James, Norah Jones, Donny Hathaway, Curtis Mayfield, and thousands more. Admission is $10 and can be purchased in advance online by visiting: www.BitterEnd.com (Direct link: http://maximaalerta.bpt.me) This will be a special concert… a night of music and fun for everyone. Come join the party. You’re guaranteed a great time. In 2003 Máxima Alerta exploded on the scene, hitting radio and television stations with two songs, “Cast pa ‘front’ and “Adegüello 1895” which very quickly became popular throughout the country. Thanks to these successes, in 2004 they delivered their new album “Llegaron los Alertas”, recorded at Abdala Studios owned by renowned singer/composer Silvio Rodriguez with the French company Lusafrica, and joining their catalog and sharing the stage with popular groups such as La Orquesta Aragón, Polo Montañez, Anacaona, Isaac Delgado, Osdalgia, among others. In 2005 Máxima Alerta was nominated to Cubadisco as “Best Album Rap, Dance and Hip Hop” which garnered the group great popularity both nationally and internationally, as well as topping the charts. Later in 2009 the group returned to the top of the charts with the song “La Figura” recorded with the group Gente de Zona. Later in 2011, they released the CD “Alertas para Todos”, recorded and produced by Nando Pro in Havana, Cuba. This is an album containing fourteen tracks, of which six featured special guests: Yulien Oviedo and Dantes (Charanga Habanera); Alexander Delgado y Randy Marcos (Gente de Zona); Sisto Llorente “El Indio” (Orquesta Aragón); Los Cuatro; and Alain Daniel and Ramón Lavado (El Chacal). The CD also features a song dedicated to one of the greatest Cuban baseball players, Victor Mesa. After settling in the United States, Ray Machado reorganized the group and recorded a new production. In October 2015, Maxima Alerta was reborn in the United States performing in two SOLD OUT concerts in New York with Fernandito Villalona. In 2016, Maxima Alert released its new song “Vive la Vida” with an accompanying music video. Subsequently the group had a SOLD OUT concert at the legendary Maxwell’s in Hoboken, and another SOLD OUT concert with Latin bachata star Anthony Santos at the historic 1,500 seat Park Performing Arts Center. Established in 1961, The Bitter End is the oldest rock and roll club in New York City. The classic red brick stage backdrop and intimate vibe make this historic venue almost as iconic as its headliners. For over 50 years, our audiences have been blown away by legendary artists like Stevie Wonder, Bob Dylan, Lady Gaga, Jackson Browne, Neil Diamond, Gavin DeGraw, Woody Allen, Jon Stewart, Randy Newman, Billy Crystal, Tommy James, Norah Jones, Donny Hathaway, Curtis Mayfield, and thousands more. The Bitter End is located in the heart of Greenwich Village. We are open seven days a week and showcase live music every night, including singer/songwriters, rock , blues, jazz, funk, alternative, hip-hop, spoken word, a capella, and country. Every Monday and every other Sunday we host open jam sessions for newcomers and aspiring musicians. At The Bitter End, you never know who or what you’ll hear next.